As the popularity of video entertainment is steadily on the increase, more and more video formats are flooding into the market. However, format incompatibility is still the Achilles' heel for almost all video formats without exception. Let's take MKV video as example. If you try to import MKV video to iTunes for syncing them to your iPhone, iPad or iPod, it seems like drawing water with a sieve. Why? Don't make a fuss. This is just because MKV video cannot be recognized by iTunes, which generally supports MOV, MP4 and M4V video formats. If you want to import MKV files to iTunes, what you should do first is to convert MKV to iTunes compatible video format. Actually, the task can be achieved easily supposing you have a MKV converter. A 100% Free MKV Video Converter to Convert Videos to iTunes Compatible MOV, M4V Formats. This free MKV video converter is 5X faster than Handbrake. If you use handbrake to convert MKV to iTunes format with 50 mins, then you use this better solution to decode MKV to M4V, or MOV etc. iTunes format and add MKV HD video to iTunes with purely 10 mins. That's not the whole story. As a powerful MKV video converter, it can also change MKV to AVI, MKV to iMovie, MKV to MP4, WMV to AVI, MOV to FLV, AVCHD to MP4, H265 to H264, etc. with No.1 fast speed (Intel QSV/Nvidia/AMD hardware acceleration supports). In case your final plan is to import MKV to iTunes for syncing to iPhone iPad and more Apple devices, you can choose to directly convert MKV to iPhone, iPad preset profiles. After video conversion on Mac, you can embark on the MKV to iPhone, iPad transfer task under the help of iTunes or its alternative MacX MediaTrans, which is designed to offer you a simpler and faster solution to bulk transfer MKV videos, music, photos, ringtones, eBooks, etc. from Mac to iPhone iPad iPod or vice versa without iTunes complicated operating steps or iTunes half crashes problem. 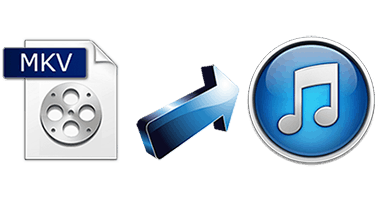 Free download this Mac free MKV to iTunes video converter and then launch it on macOS, drag and drop MKV video to the program. Or click "Add File" button to select MKV files. After the MKV videos are imported, choose MP4, MOV, M4V iTunes supported formats, or select iPhone, iPad preset profiles as output video format. To get the optimal video quality, you are enabled to adjust the video codec, audio codec, bit rate, frame rate, aspect ratio, etc according to your own demand. Click the the Folder button to choose the path where you want to save the output files in. Click "RUN" button to begin to convert MKV to iTunes on Mac. When the conversion process is finished, you can import MKV video files to iTunes and sync video to iPhone, iPad, iPod for limitless playback. Wanna change MKV to MP4 on Mac OS X? 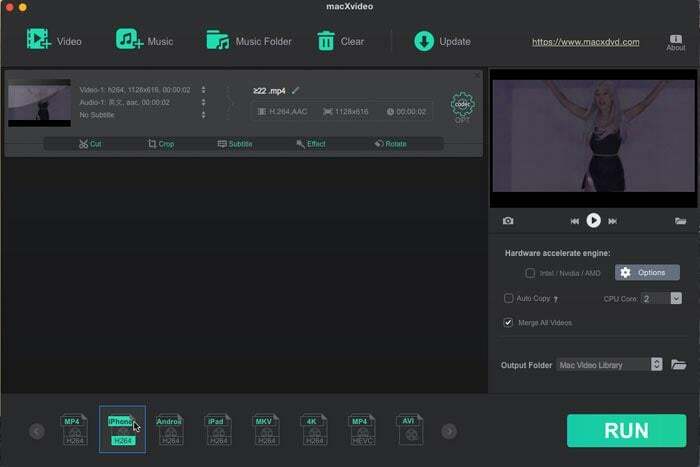 While stay on the page and you will get a good MKV to MP4 converter for Mac (macOS Mojave included), helping you encode video from MKV to MP4 with ease. The tutorial is a step by step guide about transcode videos like WMV, MKV, FLV, AVI to iTunes for free on Mac, then you can transfer them to your iPad, iPhone, iPod etc for playback. Possess numerous MKV file videos and wanna add MKV to iMovie for editing? This tutorial will show you how to convert and import MKV files to iMovie on macOS Mojave easily. macXvideo provides you with best performance in MKV to iTunes conversion with fast speed and no quality loss. It also functions perfectly in MKV to AVI, MKV to H.264, MKV to FLV, H265 to H264, etc. on Mac OS X Mountain Lion, Yosemite, El Capitan, macOS Sierra/High Sierra and Mojave.